By taking ‘collective responsibility’, brands and marketers can, and should, be making a positive difference to modern childhood. CANDY-COATED MARKETING portrays marketing to children as a widespread and often inappropriate business practice, but it also corroborates marketing’s ability to evoke and elicit change. Ultimately, it is the positive potential of this ‘change’ that is the author's primary motivation in writing. Horgan has 20 years of media and marketing experience. While working in England, she joined the Conservative Party Children’s Taskforce, from 2005 to 2007. She then consulted and contributed to the Bailey Review, which published a paper last year: Letting Children Be Children. Now based in Dublin, Horgan researches and campaigns on the commercialisation and sexualisation of children, through her journalism and the Positive Childhood Campaign. 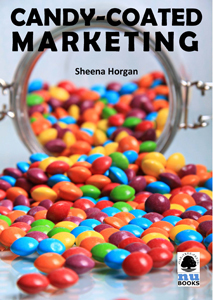 Sheena Horgan is a consultant and commentator or youth/family and social marketing issues in Ireland and the UK and has produced a well-written balanced ebook here examining issues around marketing to children. Today’s highly consumerist society is one in which children are exposed to marketing messages at increasingly younger ages and are now making significant marketing decisions for their family. This extends beyond the obvious. Motoring brands, for example, realise that the decision on the purchase of a car can be influenced by children and have adjusted their marketing budgets to embrace media such as cinema that the family watches together. Horgan draws on research to make some interesting observations. Children at age five develop the facility for making the advertising/programme distinction. They can distinguish between ads and programmes via cues that include length, characters and credits. However, children are hampered in making this distinction by having the same character in the ad and programme and so, where lines are blurred, cognition of the marketing intent is confused. This is complicated further online where branded content can be presented as games and activities.